I submitted my site "AbVideo1.com" for rating. Ownership has been verified and I added the text to my master ASP file in the head. I wasn't sure if it is supposed to be there or in my default.asp file. If this is the correct place for it, then I was wondering if I am missing something else or it just takes awhile for it to be rated so I can get rid of the "Scam Insight: Personal Information Risk" warning? Thanks. Scam Insight mostly works on heuristic based detection [on the fly detection with no database], it is implemented on Norton toolbar. Since Scam Insight works in client side and it is on the fly detection, on fairly new sites, it may happen that site is rated as Untested in SafeWeb. Some users see it and others don't. This issues might be because some users/system/browser might have disable Norton toolbar or Scam Insight might have difficulty in collecting above mentioned details. 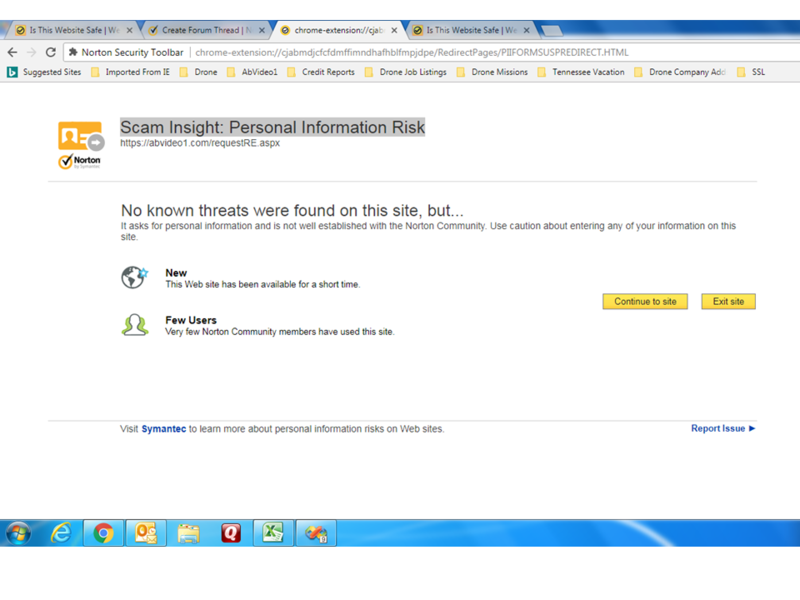 Note: Usually, as websites get more users...then Scam Insight starts trusting the site and reclassifies it as safe. I just checked out your site. I didn't get any scam insight warning. The site does show it's untested now. I will submit it to Safe Web Team. The Meta Tag is placed fine. Thanks for the quick response. For the most part everything does work without getting the scam insight warning, but it is when you make a selection from the home page for a free estimate that the warning comes up. I am sure it is because, I ask for some personal information so I can get in touch with the person asking for an estimate, but it is an https site with an ssl certificate. The other thing that happens, is when you get the scam insight warning and click on continue to the site, it just comes up with a blank screen. How can I fix that, so if someone gets that and does want an estimate for my drone services to sell their house and they click on "continue to the site", it will actually give them the form to submit? Thanks again for your help. I will notify the Safe Web Team about your questions. I will remind them about your thread since I see that they haven't come yet to this thread. Please stay tuned to this thread for a response from the Safe Web Team on Thursday night after midnight EST. Your site 'abvideo1.com' has been submitted for analysis and it is currently rated green in safeweb.norton.com. Hi, I just saw another forum where manic_drone had the same problems that I am having with Scam Insight. It said his website was white listed in Scam Insight to fix it. How do I go about getting my site "https://www.AbVideo1.com" white listed in Scam Insight? Thanks. I do have a link for white-listing. Please use this link for whitelisting. Having your site getting the Safe Web listing hasn't helped? You should be getting a green listing now in Safe Web. Scam Insight is part of Safe Web. Please see the above KB. Symantec no longer offers software vendors a proactive whitelisting partnership. If your software is currently detected by Symantec and you wish to report a false positive, please use below option. Is anyone looking into this? It has been over a week now and I still get the scam insight when selecting the form for a free estimate. Also, when selecting to "Continue" to the site from the Scam Insight screen, all I get is a blank page. If the Scam Insight can not be removed till enough people visit, can you please at least fix it so they can continue to the form to submit information for a free estimate if they choose to. Please see attachment. Thank you. I will bring this up to the Safe Web Team. I just tried your site. I got the scam warning where you said. I then tried Continue and I got your request Form for the estimate. We have whitelisted your site 'abvideo1.com' in Scam Insight. Thank you very much. It is working now. I'm glad that every thing is working ok now. It looks like whitelisting can only happen when an Employee does it directly. We can't suggest the link any more. Good Luck with your company.